Using time as an actual storytelling device within a story beyond simply a framing measure was something that the classic series of Doctor Who did all too infrequently and something that Big Finish has proven adept at integrating with mostly great success. In ‘The Bad Penny’ by Dan Starkey, a time turbulence takes the TARDIS off course, and the Doctor and Leela find themselves visiting the Cross-Keys Hotel in the middle of a temporal paradox and an ill-intentioned plan. In the 1970s, hotelier Ron Tulip is having a difficult time as the few customers not disappearing without payment complain of strange noises, and a mysterious summons to the VIP suite he didn’t even know existed presents an opportunity that could change his fortunes forever. To Starkey’s credit, the story of the colliding time zones within this hotel unfolds naturally with little confusion, and the glimpses of the futures afforded the characters create an air of inevitability that is anything but optimistic. The character of Ron Tulip who is so down on his luck and down on himself is particularly interesting, and Greg Haiste believably portrays a man who suddenly sees an avenue to success open up before him that he is all too keen to explore. Keith Barron’s charismatic Lord Tulip sells the pitch incredibly effectively and understandably gains Ron’s trust, but the Doctor pieces together all too quickly the truth behind this secretive older figure who seems to be missing key memories that he should have given the events immediately preceding their first real encounter. Unfortunately for those in the hotel and soon for those outside as well, Lord Tulip has brought a very particular business associate with him, and as the time anomaly feeds on itself while futures try to align, the Hadean parasite continues to grow stronger with all of the temporal energy coursing around it. There is unquestionably much more story that could be told regarding this being and its dangerous effects as it grows stronger and continues to spread, but even as told it represents an intriguing and perilous additional threat to supplement the usual temporal hazards as a new timeline threatens to supersede the established one. Leela finds herself at the core of the shifting timelines while the Doctor tries to piece together how to resolve this dilemma, and both Louise Jameson and Tom Baker give their typically emotional and riveting performances to sell the intensifying danger around them where nothing is certain. 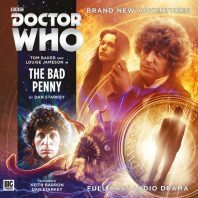 The trouble with ‘The Bad Penny’ is that its plot simply seems too rushed given the many ideas and intriguing visuals introduced. There is easily enough material for a third and maybe even a fourth episode to truly give the whirlwind of characters and concepts the time they need to really breathe and develop, and so everything not directly involving the Tulips ends up feeling more like window dressing than the actual plot points these notions were clearly intended to be. The Doctor mentioning that Ron is taking words and promises at face value with an implicit trust in the figure he does not know seems like a shortcut to advance the plot as well even if the reason behind it makes a sort of logical sense given the connection. Apparently Starkey wrote this as a much longer story, and this is a case where the trimmings probably hurt the story given the complexity and development of everything happening within the hotel that can only be hinted at in this shorter format. To his credit, though, Starkey’s many characters and settings all come to life vividly and still create an intriguing adventure that leads to Ron’s ultimate discovery of the truth and his decision about what his future must be as the massive anomaly focused on one innocuous object is closed at both ends and time resumes its linear progression.